Rosemary Foot and Andrew Walter. China, the United States, and Global Order. Cambridge: Cambridge University Press, 2011. ISBN: 9780521898003 (hardback, $93.00); 9780521725194 (paperback, $32.99). Overall, our three reviewers praise the book’s success. Chaowu Dai gives credit to the methodological approaches and inspirational analyses of the authors; Daniel Drezner notes the authors’ effort to look systematically at how both China and the United States interact with global norms and structures. Previously, scholars tended to focus on one country, such as John Ikenberry on the United States and Alastair Iain Johnson on China. Miles Kahler also affirms Foot and Water’s valuable comparison of China’s and the United States’ consistency with global norms. Although China and the United States are dissimilar in terms of their political systems, the authors were able to do “a systematic comparison across issue-areas to drive their conclusions.” The book is “unique, thought-provoking, and timely,” as Kahler tell us. The reviews also raise several theoretical issues and a few specific empirical matters. Drezner and Kahler both raise concerns over the authors’ constructivist approaches to international relations. Kahler asks why the authors chose global norms instead of possibly less contentious “international rules or agreements” as the appropriate benchmark for measuring behavioral consistency. Kahler also notes that”[B]y eliminating human rights and democratization from their analysis, their results are skewed in favor of China, whose behavioral consistency has diminished in those issue-areas in recent years.” He also hoped to see more coverage on civil society organizations. On specific empirical matters, Daniel Drezner believes that the authors are too dismissive of the Proliferation Security Initiative. He also notes that the authors’ use of the same organizational model for each chapter leads to a degree of narrative repetition. Chaowu Dai’s criticism mainly focuses on the book’s discussion of China’s attitude toward norms and rules concerning the use of force. In their response, Foot and Walter find the reviewers’ criticisms constructive, but carefully elaborate their own positions at some length. In sum, this book should become essential reading for anyone interested in China’s “rise” and America’s place in the world. Rosemary Foot is Professor of International Relations and the John Swire Senior Research Fellow in the International Relations of East Asia, St Antony’s College, University of Oxford, where she teaches predominantly on the International Relations postgraduate programme. Foot is also an elected Fellow of the British Academy. Author of several books, these include two on US policy during the Korean War published as part of the series “Cornell Studies in Security Affairs”; The Practice of Power, on US-China relations published in 1995 with Oxford University Press (OUP); and in 2000 Rights Beyond Borders: the global community and the struggle over human rights in China (OUP). She has also coedited five books, including in 2004 (with Barry Buzan), Does China Matter? A Reassessment (Routledge). Other monographs have covered Human Rights and Counter-Terrorism in America’s Asia Policy (2004) as well as Framing Security Agendas: US Counter-terrorist Policies and Southeast Asian Responses (2008). Her research interests cover the international relations of the Asia-Pacific, aspects of US-China relations, as well as the relationship between human rights and human security policies in Asia and beyond. Andrew Walter is Reader in International Political Economy at the London School of Economics and, since 2001, Academic Director (LSE) of the TRIUM Global Executive MBA Programme. He is also Research Associate in the Department of Management at the LSE and on the Council of Chatham House, a leading British think-tank of international affairs. His two areas of research concern the political economy of international monetary and financial issues and East Asia in the global political economy. His recent books include Governing Finance: East Asia’s Adoption of International Standards (Cornell 2008), Analyzing the Global Political Economy (Princeton 2009), China, the United States, and Global Order (Cambridge, 2011), and East Asian Capitalism (Oxford, forthcoming 2012). Dai Chaowu is Professor of history at East China Normal University and senior fellow at ECNU’s Center for Cold War International History Studies. Prior to coming to ECNU in 2007, Professor Dai taught at PLA International Studies University (1988-2003) and Nanjing University (2003-2007). His main research interests are China foreign relations during the Cold War, especially China-United States relations and China-India relations. He is the author of Confrontation and Era of Crisis: Taiwan Strait Crises and China-United States Relations,1954-1958 (Beijing: Social Science Document Printing House, 2003); American Diplomatic Thoughts in History (Beijing: Renmin Press, 2007). He is currently working on the research project of Mao Zedong, Nehru, and the Sino-Indian Border War of 1962. Professor Dai received his Ph.D. from Northeast Normal University in 1996. Daniel W. Drezner is professor of international politics at the Fletcher School of Law and Diplomacy at Tufts University, a contributing editor for Foreign Policy, and a senior editor for The National Interest. Drezner is the author of four books, including All Politics is Global (Princeton University Press). He received his B.A. from Williams College and his Ph.D. from Stanford University. He is currently working on a book on global economic governance under stress. Miles Kahler is Rohr Professor of Pacific International Relations and Distinguished Professor of Political Science in the School of International Relations and Pacific Studies and the Political Science Department, University of California, San Diego. His research includes global governance, international and regional institutions, and international political economy. His recent publications include “Asia and the Reform of Global Governance” (Asian Economic Policy Review, December 2010) and “Humanitarian Intervention, Legitimacy, and International Institutions,” (Politics, Philosophy, and Economics, November 2010). Rosemary Foot has a well-earned reputation as a scholar of the Korean War and China-U.S/ relations. Andrew Walter is recognized for his studies of the global political economy. This first-rate book, China, the United States, and Global Order, treats current concerns within a broad historical and theoretical context, explores the depth and scope of presumed factors and constraints which “determine the role that both China and the United States play in relation to global order”(274), and underscores the complexity and abiding tensions inherent in the relationship between the global order and the U.S.-China state-to-state relationship. Chapters examine a wide range of “the United States’ and China’s changing attitudes towards and behavioural consistency with regard to” (2) use of force, macroeconomic policy surveillance, the non-proliferation of nuclear weapons, climate change, and financial regulation. At same time, chapters investigate how their relationship is mediated within major international institutions, including the United Nations, the World Trade Organization, the International Monetary Fund, and the World Bank. China, the United States, and Global Order raises significant questions: “First, what factors shape the degree to which actor behaviour is consistent with global order norms? Second, what has determined the degree of Chinese and American consistency with global norms in different policy areas? Third, how has their bilateral relationship influenced those levels of consistency” (2)? Foot and Walter are excellent in their discussion of the relationship and interplay among these factors which they consider critical to the contemporary global order and China-U.S. relations. They bring a tightly focused interpretation to what they call “behavioural consistency with global norms” and in the process, they raise new issues and provide a carefully constructed and engaging examination of the China-U.S. relationship in the global order. Foot and Walter define the Unites States and China as “the two most important countries in the contemporary global order,” because “they have an important and evolving bilateral relationship, and that this has developed to become the most significant and complex bilateral state-to-state relationship in the global order.”(15) Central questions for their study are “how much the global order affects the evolution of this relationship, and how much the relationship in turn reinforces or challenges this global order”(15). The reason why Foot and Walter choose China as a key actor to study is its importance to the United States and to the global order. The choice is well considered because of “China’s rapid growth, its economic size and population, its prominence as a global trader, its significance as an international creditor, together with the pace of its increasing influence in regional and global politics in the security, energy, and environmental areas”(21). They revisit the impact of American exceptionalism on U.S. foreign policy behaviour in reference to global norms. The three visions of exceptionalism in the book are well chosen for exploring the complexities in the characteristics of the American case, especially insofar as it is the “ultimate custodian of international order”(16-17). The authors assign the core and the centrality of China-U.S. relationship to the global order. They claim that “From 1972 to the end of the Cold War, security was at the core of the bilateral U.S.-China relationship; from the 1990s, human rights and economic issues became increasingly important and more strongly connected with security factors”(18). Under such circumstances, the bilateral relationship became increasing complex because of the importance of the U.S. market for Chinese exports, the importance of Chinese holdings of U.S. debt, the exchange rate, and climate change. Although they highlight the growing importance of economic, environmental and social aspects of the U.S.-China bilateral relationship, the dimension of military and strategic competition is not diminished in their study. More importantly, their focus on the central role of the United States and China in the international system does not actually mean that the “global order is approaching a condition of ‘bipolarity,’ as it did during the Cold War. For this reason, “as well as reasons relating to procedural legitimacy,” the authors are not convinced “of the viability of proposals for the creation of a ‘G2’” (20). Predictably, “while the United States adjusts to China’s resurgence, there are also other newly resurgent or rising states that are capable to varying degrees of mounting economic or strategic challenges to both Washington and Beijing”(300). Foot and Walter detail the influence of the global economic crisis that began in 2008-09 upon the United States and China respectively. Historians may someday debate whether the crisis is “most notable for how much damage it did to the United States, or how little it inflicted on the world’s major rising power, China,” as Joseph Kahn has argued. The crisis, according to their analysis, “hurt the United States disproportionately in the short term and may accelerate an erosion of its military, economic, and cultural preponderance”(1). Most importantly, “The crisis has also reduced US self-confidence in the validity of its economic model and its willingness to ‘lecture’ Chinese officials in bilateral meetings. In contrast, China’s model has seemed relatively robust and its government appeared capable of taking decisive actions to maintain growth”(19-20). Foot and Walter are optimistic about the future of American leadership, “America’s primacy in global politics and economics, including its position in many global institutions, remains considerable, and its impact on key global issues, either through its neglect of or participation in their management or resolution, will remain a central influence upon the evolving global order for decades to come” (i), although it is uncertain as to how the global economic crisis will affect their long-run relative positions (1). This kind of judgment contributes to understanding the development of China-U.S. relations and the global order. Undoubtedly, their research has practical significance in projecting tendencies in China-U.S. relations. Highlighting the importance of China-U.S. cooperation, the book examines the potentiality which would spark conflict and confrontation from a different perspective. Foot and Walter rightly argue that “while relations have been far easier to handle and beneficial strategically overall since 1972, U.S. adjustment to China’s rising power and presence has not been easy for it, and we cannot be sure that serious clashes between these two states will not occur at some time in the future, perhaps over matters involving freedom of the seas”(75). The South China Sea may witness such kind of scenario. Overall, as an illuminating and thought-provocative book, China, the United States, and Global Order provides not only a sense of intellectual wholeness based on a global conception of the U.S.-China bilateral relationship, but also the inspiration for Chinese scholars to explore the way in which “the United States and China manage their relationship within this complex system of global order affects their attitudes towards the norms that influence its stability and evolutionary path” (2). Brilliant in methodological approaches and replete with inspirational analyses, the book should prove a major contribution both to the study of the China-U.S. relations and to explorations of the global order. Foot and Walter’s study is undoubtedly provocative; a new perspective rarely comes, however, without questions. This review covers only a portion of the issues raised in the book. The authors impress when they argue that “many of China’s conflicts have involved territorial issues, and in its early decades in order to consolidate the new state and to complete its national unification project it was willing to risk war to make good on its claims”(53), but it is questionable when they assert that “Mao Zedong believed in the positive benefits of struggle and conflict, supported an argument associated with just war that could be found elsewhere in the Third World and in other socialist states, and called for revolutionary insurgency” (51-52). Here, in particular, the authors make no reference to the ideological role when Mao decided to bomb Quemoy in 1958 and to launch the “War of Self-defense Counter Attack with India” in 1962. The bombardment and the self-defense counter attack were closely related to the Chinese Communists’ ideological differences with Nikita Khrushchev’s Soviet Communist party. Khrushchev believed that opposing peaceful co-existence and insisting on the anti-imperialist struggle would certainly make the international situations tense and would fundamentally harm the common interests of socialist camp. But China’s view was just the opposite. Mao Zedong believed that tension “could arouse the masses, backward strata and people in the middle to struggle,” and at the same time “a tense situation could make people all over the world stop and think, and could mobilize people all over the world, workers, and other laboring masses to make a few more communists.” Mao Zedong also believed that struggle against the U.S. could eliminate people’s superstitious fear of the U.S. In the view of the Chinese leaders, bombardment of Quemoy and creating a tense situation was also a means to achieve this goal. The primary goal of the the Sino-Indian border war of 1962 was to demonstrate to Moscow the accuracy of Beijing’s strategy on how to deal with nationalist countries like India, not just for the disputed territory. Teaching Nehru a lesson and forcing him take up Beijing’s proposal for direct negotiations, for the CCP leaders, were the main calculation in launching an attack along the border. The “War of Self-defense Counter Attack with India,” valued by the leaders in Beijing as the “international class struggle,” would “demonstrate further Nehru in his true colors as a reactionary nationalist, debunk Nehru’s peaceful neutrality and his nonaligned policy, expose the Indian reactionary’s anti-China, and anti-the-people plot of what were instigated by imperialists, and at the same time keep the Khrushchev clique in trying situation.” When the war broke out, the CCP leaders believed that the frontier defense troops of Tibet and Xinjiang were in the front line in the struggle against Nehru and Revisionism. Marshal Chen Yi, Minister of Foreign Affairs, in his speech in September 1962 stressed that, “a lot of facts prove that our struggle against the united front of Kennedy, Khrushchev, and Nehru is necessary and un­av­oid­able.” Mao himself later saw the war as a military battle on the political front or a political battle on the military front. One does not have to dig very deep into public discourse to find the belief that the question of the next decade is how the world order will adapt to a waxing China and a waning United States. Will China embrace the set of pre-existing global norms or seek to revise them? Will the United States continue to assert its privilege in setting global norms, or retreat into unilateralism or isolationism? Beyond the punditry, very few scholars have bothered to look systematically at how both of these countries interact with global governance norms and structures. There are exceptions but they tend to focus on either one country ((John Ikenberry) or the other (Iain Johnston), or are narrowly tailored to a single issue. 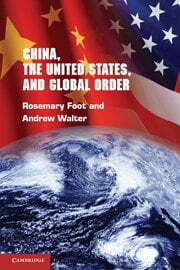 Rosemary Foot and Andrew Walter’s China, the United States and Global Order tackles the general question of Sino-American interactions with global rules and norms in a rigorous and informative manner. The book looks at the state of play in five separate issues: the use of force, macroeconomic policy surveillance and coordination, nuclear nonproliferation, climate change and financial regulation. Each of the substantive chapters has the same schema: 1) a discussion and overview of the existing set of norms in the given issue area; 2) a recounting of American compliance with those norms since their creation; a similar recounting of Chinese compliance with those norms; and 4) a concluding assessment. The cumulative effect can be a bit tedious on occasion – in every chapter, one has to read about China’s post-Mao awakening to the outside world – but the tight organization of the subject matter is elucidating. Foot and Walter conclude that, in the main, post-reform China has “moved from a position of generally low behavioural consistency towards gradually higher levels (275) ” in four of the five covered areas. Macroeconomic policy coordination is the exception; as the PRC has become a systemically important actor, it had resisted outside pressure to coordinate. The United States has been more historically selective in adherence to norms. This is ironic, since the United States propagated many of the norms discussed by Foot and Walter. They conclude that the degree of adherence is largely a function of the “the level of domestic social and political significance that the framework has for each country; the extent to which it is procedurally legitimate… and the extent to which this distribution [of costs and benefits] is perceived to affect the global power hierarchy (280).” The strength of American exceptionalism implies that a wider variety of issues are seen as domestically salient than in post-Mao China. On the other hand, as China becomes more important systemically, rising levels of nationalism might reduce Beijing’s willingness to comply with global order. Foot and Walter discuss these wide-ranging issue areas with a degree of empirical sophistication that borders on the astonishing. For example, their treatment of China’s evolving relationship with the responsibility-to-protect doctrine reflects Beijing’s evolving, nuanced approach to United Nations peacekeeping. Contrary to perceived wisdom, China has slowly but appreciably shifted its position, reconciling itself to some aspects of the responsibility to protect doctrine. As the situation in Darfur worsened, China changed its approach from stoutly defending the Sudanese government from intrusions on its sovereignty to pressuring that same government to accept peacekeepers (49). Similarly, Foot and Walter’s treatment of American ambivalence to global norms is equally sophisticated. In their discussion of multilateral surveillance, they keenly observe the paradox of early Cold War institution-building. On the one hand the United States set up the Bretton Woods institutions of the World Bank and IMF. On the other hand, when confronted with economic crises among allies, the U.S. responded “outside of the formal framework of IMF- based surveillance (85).” This established a more general pattern of U.S. interaction with multilateral economic institutions: deep engagement in the creation of norms, but forum-shopping when stymied or constrained by those same norms. Standard scholarly treatments of both of these issues often elide such subtleties – it is a credit to Foot and Walter that not much gets past their keen analytical assessment. There are a few empirical gaps. In the chapter on nonproliferation, Foot and Walter are far too dismissive of the Proliferation Security Initiative (PSI) as accomplishing little and representing a challenge to existing nonproliferation norms. While it is true that China has firmly resisted having its norms embraced in the United Nations Security Council, PSI had an appreciable effect on nonproliferation while gaining wider acceptance. The initiative did play a role in forcing Libya to renounce its WMD program, and contrary to the fears of some international lawyers, it has not eroded other nonproliferation norms. The PSI example highlights perhaps the biggest challenge to Foot and Walter’s account: their avowedly constructivist take on global order. Consistent with the constructivist paradigm, they make it clear that they believe powerful global norms are socially constructed and at least partially independent of great power preferences. They conclude that the Bush administration’s attempt to deviate from climate change norms was a failure, for example, because of the independent power of norms. This argument works in some of the cases that they discuss. Its explanatory domain is narrower than they would like to believe, however (including climate change, as those negotiations have played out in recent years). This is revealed in their treatment of alternative theoretical paradigms. They claim that realists stress the role that “procedures and enforcement mechanisms attached to most global normative frameworks (296)” in determining global governance outcomes. It is safe to say that is not how realists actually think about global order. Realists would instead argue that the primary driver for adherence to global norms is the consistency between those norms and the national interests of powerful states. Similarly, Foot and Walter stress the significance of domestic institutions and actors in determining the “solidarist” adherence to global norms (versus pluralist opposition). There is nothing inherently constructivist about this argument, however – plenty of international relations scholars working in a liberal or pluralist vein (Moravcsik 1997) would reach exactly the same conclusions as Foot and Walter. There is an interesting debate to be had between Foot and Walter and other global governance scholars about the extent to which Chinese and American adherence to global rules and norms is a function of constructivist causal mechanisms or alternate causal mechanisms. Indeed, Foot and Walter’s observations in the substantive chapters of their book are so sharp that this reader wishes that they had been a bit more expansive on these theoretical debates in their concluding chapter. These are small cavil, however: with China, the United States, and Global Order, Foot and Walter have produced a must-read for anyone interested in the future of global governance. Although the United States and China are often identified as rivals for international economic and military primacy, they are rarely compared directly. American exceptionalism is matched by Chinese exceptionalism, at least in the scholarly world. In undertaking this valuable comparison of American and Chinese foreign policies and their consistency with global norms, Rosemary Foot and Andrew Walter recall a classic work by Zbigniew Brezinski and Samuel P. Huntington. Published at the height of the Cold War, that earlier comparison of the United States and the Soviet Union was an original (and, to some, shocking) attempt to compare the exercise of power at home and abroad by the two superpowers. The Foot and Walter comparison of China and the United States will hardly have the same shock value, although one of their conclusions—that China demonstrates more behavioral convergence on global norms than the United States—is likely to provoke discomfort on the western side of the Atlantic. Their accomplishment cannot be denied, however: taking two dissimilar political systems with radically different histories and power positions, they allow a systematic comparison across issue-areas to drive their conclusions. The result is a unique, thought-provoking, and timely work. My comments aim to both question and extend the authors’ arguments. They fall into three areas: the normative framing of the book, domestic politics as the core explanation, and the future trajectory of China’s international behavior. The theoretical core of the book lies in a comparison of behavior (policy) with global norms. By relying on norms, Foot and Walter create a thicket of empirical issues that might have been sidestepped if they had substituted rules or agreements. At many points in their case studies, those observables serve as proxies for norms. How norms become global norms; what level of contestation is allowed for a global normative consensus to be declared; how powerful states create a normative environment that they cannot easily change: all of these knotty and unresolved questions become more central than they might have been using a different theoretical frame. Given the empirical difficulty in identifying norms–and questions about their emergence, identification, and contestation noted above–assessing behavioral consistency is less than precise. The behavioral differences between China and the United States are explicated in the empirical center of their book, five rich and detailed case studies of issue-areas that span international security, the global economy, and the environment. These case studies, in their careful narratives and their analytic rigor, will serve scholars and students of international relations and international political economy very well. (I have already used them successfully in a graduate course.) These chapters also form the basis for explanations that Foot and Walter advance for observed behavioral differences between the United States and China. For Foot and Walter, domestic politics is a favored explanation for the behavioral differences observed between the United States and China. More precisely, the “level of domestic political and social significance” of the norm is associated with lower levels of behavioral consistency. Their assessment seems accurate, but the domestic variables that influence norm-consistent behavior (or compliance with international rules) could be sharpened. Foot and Walter seem to tiptoe around the democratic-authoritarian distinction between the United States and China. Failure to dwell on that fundamental political distinction is necessary to win acceptance for their comparative quest: too often China’s authoritarianism has been allowed to obscure more complete readings of international behavior on the part of these two big powers. On the other hand, by eliminating human rights and democratization from their analysis, their results are skewed in favor of China, whose behavioral consistency has diminished in those issue-areas in recent years. More fundamentally, however, other key domestic political variables are shaped by political regime type. At least five specific and important domestic variables are common to many of the cases that the authors analyze; although they are often noted, they should be highlighted. First, Foot and Walter return to China’s difficulty in effectively implementing international rules. In an issue-area such as financial regulation, open distributional conflict in the United States can hold up international agreement. In China, elite acceptance of international rules may be relatively easy, but the fraying Leninist party-state is often less than responsive. China’s implementation in several of the issue-areas has been slow and partial, and, one suspects, those at the top meet non-compliance with a wink. Implementation is linked directly to the authoritarian character of the regime. Compliance constituencies in most liberal democracies have multiple channels through which to press for better observance of international rules, including an independent judiciary. That is less likely in China. Second, and related to implementation, lack of transparency skews a reading of outcomes, a fact that is too often downplayed by Foot and Walter. Given the opacity of China’s political process, whether behavior is consistent with norms and whether norms are genuinely accepted or embedded in policymaking is very difficult to determine. Here, more attention to the work of Iain Johnston and others on socialization would have been beneficial. Tracing at least some of the bureaucratic and political avenues for normative change, even in a cursory way, might have shifted the perception that politics in the United States is typically a barrier to convergence on global norms while politics in China points in the opposite direction. Fourth, the authors might have emphasized, across issue-areas, a domestic constituency that is common to the two countries: big, internationally-oriented business sectors. The influence of these interests on behavior is striking across the case studies: state-owned banks with international ambitions support Chinese compliance with international regulatory standards; energy firms contest global climate change in the United States; the nuclear power sector in both countries complicates non-proliferation norms (but the nuclear industry in China backs non-proliferation because of incentives offered by the U.S. and others). The “green energy” sector, of growing importance in both countries, is not mentioned for its influence on climate change policy. Across these domains, capitalism and China’s variant of state capitalism both demonstrate the importance of concentrated economic power. Finally, in one of their most important findings, Foot and Walter draw attention to the domestic political incentives–arguably the most important incentives–for compliance with international norms and rules. In both cases, reputational considerations are not solely international: Barack Obama’s domestic political appeal lay partly in his promise to restore the international reputation of the United States; for China, a reputation as a responsible and pacific power was central to both regime legitimacy and its strategy for reducing international resistance to its growing power. For the Chinese elite, however, international norms were often “borrowed” in a more direct way. They served to promote the influence of particular bureaucratic actors (in financial regulation) and to overcome domestic opposition to economic reform. Indeed, a careful reading of Foot and Walter’s case studies suggests that congruence of international norms and rules with domestic political incentives created the strongest records of behavioral consistency. Among its many strengths, China, the United States, and Global Order does not over-emphasize the importance of the bilateral relationship in shaping national convergence on global norms. Foot and Walter instead treat the importance of that relationship as a variable, one that is more or less significant depending on issue-area. The big story that the authors rightly emphasize is China’s adaptation, for the most part, to existing international norms in these issue-areas. China has made a remarkable shift from revolutionary polity challenging many of the core norms and institutions of international politics to loyal supporter of many rules that it had no role in creating. Foot and Walter are absolutely right in underscoring that record. A second trajectory is also evident in the book, however, and it bodes less well for the future: when international rules impinge too directly on Chinese policymaking autonomy or coincide less well (or not at all) with regime survival and stability, China’s record is less positive. As China’s power within issue-areas grows, its behavioral consistency is unlikely to be any greater than that of the United States, and, given its distinctive political regime and political economy, probably less. Among the members of the G-20, the largest economies in the international system, only China and Saudi Arabia are authoritarian regimes. China’s sensitivity to issues that impinge on its domestic political order, when coupled to its status as a major economic competitor, may produce a future with less normative convergence than the recent past. On the other hand, the growing importance of internationalized economic interests and the regime’s ability to suppress distributional conflict may lead to a continuation of China’s trajectory. We can only hope that Rosemary Foot and Andrew Walter will provide us with another sweeping and comprehensive review of the two economic giants and their place in the global order in a decade’s time. We are very grateful to H-Diplo for organizing this roundtable review and to the three reviewers for their positive, thoughtful and extensive reviews of our book. We welcome the opportunity to respond to their very constructive criticisms. In this response we do not try to address all of the points raised by the reviewers, particularly those with which we largely agree, but we endeavor to address those where obvious differences exist. We also take the opportunity to clarify where necessary our own stance on particular questions or empirical issues. We first address the theoretical issues raised by the reviewers, which constitute the majority of their concerns, before turning to the few specific empirical matters with which reviewers took issue. All the reviewers note that we draw considerably upon constructivist approaches to international relations, and Daniel Drezner and Miles Kahler both raise concerns related to this. Our framework sometimes draws criticism from realists for its constructivist elements, whereas constructivists are more likely to take issue with the realist/materialist aspects of our approach. Still others cast us as liberals, wedded predominantly to a domestic-level explanation. These different reactions are perhaps inevitable for two main reasons: first, we use “global norms” (and associated rules, principles and standards) as our benchmark for measuring behavioral consistency; and second, our theoretical framework is synthetic in nature, allowing for both normative and material variables to drive behavioral outcomes, and taking into account domestic actors and institutions as well as cross-border interactions. We take this opportunity to clarify briefly what this means. There are three explanatory variables in our framework: degree of fit between global norms and dominant domestic-level norms, actor perceptions of procedural and substantive legitimacy in global order frameworks, and actor perceptions of the consequences of their own and others’ behavior for the global power hierarchy. The first variable would fit comfortably in many constructivist approaches and the third in many realist ones; the second is “constructivist” in that it emphasizes perceptions of legitimacy, though we frame it broadly to include actor expectations concerning the material distributive consequences of global normative frameworks, both within and between countries. However, the perceptual element in these formulations is important to note here in reference to Kahler’s comment about third party observers. In our framework, the relative explanatory importance of the three key variables is contingent on the level of domestic salience of the issue area. When domestic salience is high, the degree of normative fit is the primary driver of behavioural consistency and the other two variables are less important. When salience is low, degree of normative fit becomes less significant and the other two variables play a more important role in driving behavioral outcomes. In such areas, governments will have greater autonomy from domestic social and political constraints and the degree of fit between global and domestic norms will by definition be loose. We thus agree entirely with Drezner’s point that realists argue that behavioral consistency with global norms is primarily driven by the perceived alignment of those norms with so-called national interests; it is only when global norms and national interests are poorly aligned that the strength of external enforcement mechanisms becomes a potentially important factor. These latter are unlikely to be decisive for great powers, so we are less surprised than Kahler that this turns out to be the case for our two countries. We also agree with Drezner that degree of “normative fit” will not always be decisive, as we show in cases where domestic social and political salience is relatively low (e.g. nuclear non-proliferation and the limited use of force). And we accept unreservedly that there is overlap between our three main variables and other theoretical frameworks, including rational (domestic) institutionalist ones. Kahler quite reasonably asks why we chose global norms instead of possibly less contentious “international rules or agreements” as the appropriate benchmark for measuring behavioral consistency. Our rationale is that the rules, principles and standards that constitute the detail of international agreements generally reflect higher-level norms – though we accept that these norms can be multiple and contradictory. For example, in the area of financial regulation, the Basel Committee elaborated from the late 1980s two general normative principles of promoting international financial stability and an approximately level playing field; only later in the 1990s was a third norm added to these, that of promoting a greater reliance by supervisory agencies on private sector risk management techniques. We therefore disagree that the only identifiable general norm in international economic agreements is the promotion and protection of international market exchange. Moreover, the negotiation of successive agreements in bodies like the Basel Committee has reflected evolving understandings of – and sometimes sharp disagreements over – the degree of conflict between these three norms and their relative priority. Similarly, in the area of macroeconomic policy surveillance, we think it important and useful to distinguish the general postwar norms of multilateral surveillance over national macroeconomic policy choices and approximate balance in adjustment responsibilities between deficit and surplus countries from specific rules such as that concerning currency manipulation (agreed in 1977). Kahler is absolutely right that our approach creates complexities and in some cases difficulty of measurement. But we think that it captures crucial aspects of reality, such as in the ongoing disagreement among IMF members about whether the currency manipulation rule and other aspects of multilateral surveillance reasonably allocate adjustment responsibilities. China had little say in either norm or rule creation in these areas, in marked contrast to the United States, but for the first few decades of IMF membership Beijing seemed reasonably comfortable with them. By the mid-2000s, the conflict between IMF surveillance and the dominant domestic leadership norms of growth and socio-political stability had become sharp. Importantly, China also increasingly argued that the currency manipulation rule – and its broadening in the 2007 Decision on Bilateral Surveillance – did not place sufficient adjustment responsibility on advanced countries, above all the United States. As this example demonstrates, one cannot understand China’s behavioural stance towards a particular international rule without taking into account its attitude towards a more general international norm. As for climate protection, there is the agreed norm of common but differentiated responsibilities – and much of the conflict within the UNFCCC and between Beijing and Washington has been precisely over the nature of the rules that will determine just how differentiated that responsibility should be. We agree with Kahler that this broader approach to understanding global normative frameworks (which is also why we chose to avoid the earlier preferred term of “international regimes”) creates behavioral benchmarks that are open to interpretation. But they are not infinitely flexible or entirely elusive – as China discovered on macroeconomic surveillance and the U.S. in its attempts to shift the norm on use of force – and the relative concreteness of internationally agreed rules and standards is also easily exaggerated. Kahler also reasonably argues that we could have said more about regime type and the “fundamental” difference between authoritarian China and democratic America. We do emphasize in various places the often overriding importance of the Chinese leadership’s interest in political survival – often linked to supposedly widely shared domestic values of social and political stability – though rational institutionalists would emphasize that the maintenance of power is also the objective of democratically elected governments. We did not place great emphasis on this distinction because we do not think it is a crucial driver of great powers’ degree of behavioral consistency toward global norms. We showed how, across a variety of issue areas, authoritarian China has moved from a position of generally low consistency with global norms and rules towards one of much higher general levels of consistency (e.g., on nuclear non-proliferation, financial regulation, and use of force). As Kahler rightly notes, there are still important areas of inconsistency for China – human rights, which we did not include in our study, is one, but there are other areas in which we also demonstrated fairly low levels of consistency (climate change and macroeconomic policy surveillance). We do not think that regime type helps much to account for this general behavioral pattern, or that omitting human rights significantly biases our conclusions. Even in the area of human rights, China’s approach to their enforcement abroad has undergone evolution given its involvement in UN peace operations with humanitarian and human rights mandates, its participation in debates leading to the development of the concept of the Responsibility to Protect, and its signature of core international human rights treaties. At home, China’s leadership is certainly not as attentive as American politicians to public opinion, but over time it has become far more concerned to address the increasingly diverse concerns of its domestic audience than was the case in the Maoist era. As for the United States, the exceptionalist impulse and strategic considerations have led to the kind of selectivity as regards the international human rights framework that we identified in other issue areas—post 9/11 developments illustrating this all too vividly. Nor do we agree with Kahler’s other point that regime type is crucial for understanding implementation outcomes in both cases. Certainly, there is much greater rule of law in the U.S. case, and this is an important difference. But we think Kahler exaggerates the extent to which a more effective judicial system among other things permits domestic pro-compliance constituencies in countries like the U.S. to improve implementation outcomes. As we showed, U.S. behavior toward a variety of global rules and norms demonstrates a consistent pattern of selectivity, a point that Drezner makes in his own work and with which most realists would agree. Pro-compliance constituencies turned out to be relatively weak in the U.S. case in areas like global climate protection, financial regulation, macroeconomic surveillance, use of force, and nuclear non-proliferation – their relative strength in the area of trade rules may be exceptional. In the area of climate protection, the much-heralded growing influence of the green energy industry lobby on climate change policy turned out to be a damp squib, with key industry lobby groups like the Chamber of Commerce dominated by corporate voices that were opposed to Kyoto and more recently to the Obama administration’s proposals in this area. In the case of China, similar constituencies received large increases in funding in the post-crisis stimulus program mainly because this chimed with the Wen-Hu leadership’s growing concerns about energy inefficiency and energy security, together with the overall unsustainability of the Chinese developmental model which led to a new emphasis upon “scientific development”. On the other issue area Kahler raises, financial regulation, domestic distributional conflict in the United States not only held up agreement on Basel II, but also prevented its implementation even after the 2004 Basel Committee deal. In the meantime, successive administrations and Congress had deliberately weakened supervisory agencies such as the Securities and Exchange Commission and the Federal Housing Finance Agency, tolerated growing evidence of considerable fraud in mortgage lending, and the Federal Reserve under Alan Greenspan met extensive regulatory arbitrage of capital and leverage rules by major financial institutions with much more than the odd ‘wink’. All this makes the domestic implementation of Basel standards in China in the 2000s (for its major banks) look relatively effective. We agree that future work requires greater attention than we gave to the bureaucratic and epistemic pathways that affect implementation outcomes in both countries. Doing so in this book would have added considerably to what was already a project of considerable scope. Similarly, Kahler is certainly right that civil society organizations can play important roles in norm creation (not our main concern) and potentially in implementation outcomes – though again, our view is that their relatively restricted role in China cannot explain the broad pattern of behavioral outcomes that we observed. Daniel Drezner argues that we are too dismissive of the Proliferation Security Initiative (PSI), but his points neglect the serious scholarly and governmental criticisms that have challenged the claimed efficacy of this initiative, the depth of the consensus that it purportedly has generated, and the overall legitimacy of its actions. Many of the interdictions have been carried out under existing export controls or national rules, there is no independent international secretariat that could guard rules of engagement and record interdiction successes and failures, and it is still seen as too closely related to U.S. threat perceptions. There is also a very generous interpretation—as formulated by the U.S. State Department– of what participation in PSI actually means. States have been deemed participants if they “formally commit to and publicly endorse, if possible, the Statement of Principles”, one of several generously worded definitions of a PSI participant. Dai Chaowu’s criticisms pertain mainly to our discussion of China’s attitude toward norms and rules concerning the use of force. Dai rightly emphasizes Mao’s desire to deploy limited force as one means of mobilizing the Chinese masses in a bipolar system with which Moscow’s leadership was far more comfortable. We are not sure that this is very different from our own argument that Mao perceived various positive benefits from struggle and conflict (51), but we certainly accept that this was driven by Mao’s distinctive ideological position and by related perceptions of China’s strategic interests vis-à-vis the two superpowers. As this reviewer notes, this contributed to a more aggressive stance towards Nehru’s India. Dai’s fuller explanation of the sources of this conflict and the eventual use of force against India add important detail to the material we presented. One point to emphasize, however, as we do in the book, is that while we argue that the bilateral China-U.S. relationship is increasingly central to the current global order and often to the policy choices made by each of these states, it has certainly not been always and everywhere the primary consideration in their policy choices. Once again, we would like to thank these three reviewers for the care they have taken in responding to our argument. We take their criticisms and suggestions seriously as we continue to think about this topic. Indeed, we may even wish to follow Kahler’s kind suggestion that we should consider revisiting this argument in the coming years. John G. Ikenberry, After Victory (Princeton: Princeton University Press, 2000); Iain A. Johnston, Social States: China in International Institutions, 1980-2000 (Princeton: Princeton University Press, 2008). Joseph Kahn, “Waking Dragon,” The New York Times, December 31, 2009. Mao Zedong Xuanji [Collected Works of Mao Zedong](Beijing: Renmin Chubanshe, 1999), vol. 8, p. 20. Instruction from the PLA General Staff Department to Front Operational Headquarter of Tibetan Military Region, 20 October 1962, see Huang Yao, Zhang Mingzhe, et al., eds., Luo Ruiqing Zhuan [A Biography of Luo Ruiqing] (Beijing: Dangdai Zhongguo Chubanshe, 1996), p. 379. Circular of the CCP Central Committee about the Question of the Sino-Indian Border Conflict and the Sino-Indian Relations, 14 November 1962, see Zhongyin Bianjie Ziwei Fanji Zuozhan Shi [The Self-defense Combat History of the Sino-Indian Border] (Beijing: Military Science Press, 1994), pp. 267-268. Huang Yao, et al., eds., Luo Ronghuan Nianpu [A Chronological Record Luo Ronghuan] (Beijing: Renmin Chubanshe, 2002), p. 865. Jianguo yilai Mao Zedong junshi wengao [Mao Zedong’s Manuscripts on the Military Affairs since the Founding of the PRC] (Beijing: Junshi Kexue Chubanshe, Zhongyang Wenxian Chubanshe, 2010), Volume III, pp. 162-163. Cecil V. Crabb, Jr., “The Testing of Non-Alignment,” Western Political Quarterly, Vol. 17, No. 3 (Sep., 1964), p. 526. John G. Garver, Protracted Contest: Sino-Indian Rivalry in the Twentieth Century (Seattle: University of Washington Press, 2001), p. 122. Prime Minister of Malaya Tunku Abdul Rahman’s comments on Sino-Indian War, see Cicel V. Crabb, Jr., “The Testing of Non-Alignment,” p. 526. People’s Daily, 15 December 1962. Daniel W. Drezner, All Politics Is Global (Princeton: Princeton University Press, 2007). Stephen D. Krasner, “Global Communications and National Power: Life on the Pareto Frontier,” World Politics 43 (April 1991): 336-366; Lloyd Gruber, Ruling the World (Orinceton: Princeton University Press, 2000). Andrew Moravcsik, “Taking Preferences Seriously: A Liberal Theory of International Politics,” International Organization 51 (Autumn 1997): 513-553. Political Power: USA/USSR (New York: Viking Press, 1964). Alastair Iain Johnston, Social States: China in International Institutions, 1980-2000. Princeton: Princeton University Press, 2008. We define domestic salience as the extent to which, in a given issue area, global norms and associated behavioural rules and principles impinge directly on the organization of domestic social and political life.